Fesko, J.V. 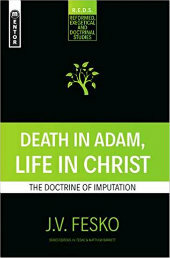 Death in Adam, Life in Christ: The Doctrine of Imputation (Mentor, 2016), 320 pp. 1. The imputation of Adam’s sin and guilt to his posterity. 2. The imputation of the sins of God’s elect to Christ. 3. The imputation of the righteousness of Christ to God’s elect. Without these doctrines, there is no Christian Gospel. For the bad news is simply this: We are born dead in trespasses and sins, having died in Adam our progenitor, and are by nature children of God’s wrath. And the good news is simply this: The Lord has laid upon Christ the sins of his elect people, Christ has suffered the wrath of God in their place, and God credits his people with not merely a clean slate (i.e. that moral state that results from having had our sins completely forgiven) but with the very righteousness of his one and only Son, Jesus Christ (i.e. all of Christ’s perfect obedience to the law of God is now our possession - we possess the perfect righteousness necessary to enter into heaven right now, and are not in need of doing any good works whatsoever in order to be saved). Yet there are many in our time who deny either one or two or all three forms of imputation, some of which, erroneously, even view themselves as faithful heirs of the Reformation. Given the popularity of some of these heretics (e.g. N.T. Wright) due to their ability to reach a wider audience than the academicians and academically-oriented scholar-pastors, it is refreshing and encouraging to hear that an accessible scholarly text has been published on such a vital issue. J.V. Fesko’s Death in Adam, Life in Christ: The Doctrine of Imputation is a recent work that does this by presenting excellent scholarship not only in a style of writing that is accessible to most readers, but also by following its chapters with concise summaries of the content presented therein.